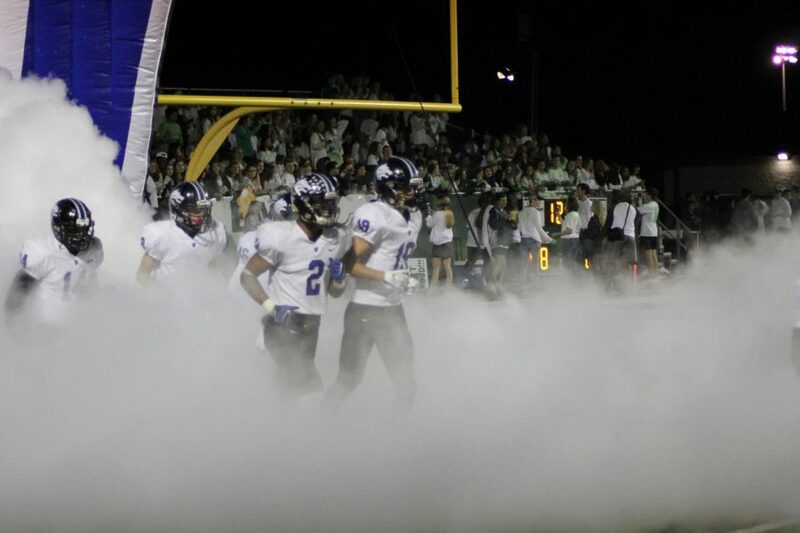 Plano West players Nick Griffin (#19) and Jacob Stephens (#2) run out of the tunnel. 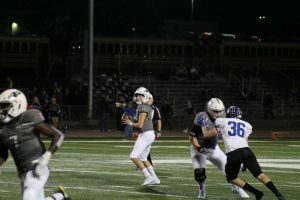 Plano West was handed their worst loss of the 2018 campaign last Friday night, losing 55-7 against the Prosper Eagles. Prosper, who’s ranked at second in District 9-6A behind Allen (8-0), has moved to 7-1 on the season. They will head to Allen next week. Plano West would be without starting QB Danny Davis (concussion) and WR Tavarius Garland (upper-body injury) against Prosper. Junior Will Cannon filled in for Davis at quarterback. The Eagles got off to a quick start, finding the end zone twice thanks to a Wayne Anderson 10-yard run and a Jackson Berry 2-yard run. They also kicked two field goals (from 29-yards and 43-yards) to take a commanding 20-0 lead by the end of the first quarter. The second quarter continued to be dominated by Prosper, who added an additional 28 points to their score to increase their lead to 48. Eagles’ QB Keegan Shoemaker threw three touchdown passes in the second quarter; a 30-yard pass to Wayne Anderson, a 68-yard throw to Hayden Metcalf, and a 7-yard pass to Jostein Clarke. Anderson also broke free with a 55-yard rushing touchdown with 2:47 remaining in the first half. The second half quieted down, but Prosper RB JT Lane ran for a 33-yard touchdown on the second play of the fourth quarter. Plano West struck for their first score of the game on the following drive, with RB Noah Scroggins rushing for an 8-yard touchdown with 7:10 remaining in the fourth quarter. There was no scoring in the third quarter. Prosper QB Keegan Shoemaker (#11) throws a pass. Plano West will host Plano East this Friday, as the Wolves will have their homecoming game and look to upset the Panthers. The Plano East Panthers narrowly escaped an attempted upset from the McKinney Lions last Friday night. The Panthers were able to kick a field goal in double overtime to beat the Lions, who are now sitting at a 2-6 record. Plano East will play against Plano West at Clark Stadium this Friday. The undefeated Allen Eagles rumbled past the Broncos on Friday, winning by 59 points. Allen, who is ranked as the best team in the state, will host Prosper, their toughest test of the year, at Eagle Stadium on Friday. The Plano Wildcats were able to reach a .500 win percentage after defeating Dallas Jesuit on Friday. Plano will play against McKinney Boyd this Friday, while the 2-6 Jesuit squad will host McKinney. Noah Karesh contributed to this report.